Oh yes! Marriages that last an entire year in Second Life are big news. To the real world, that probably seems peculiar but there’s not many people in SL who haven’t seen or experienced the high mortality rate of partnerships. So, when a couple of friends make it to this milestone it’s something to celebrate. And to celebrate, Gracee & Dest threw a party with a Grecian theme. In other words, “To-ga… to-ga… to-ga!” *giggles* The party was held on Monday night and there was a large group of friends to come and say, Congratulations Dest & Gracee! The guests included all the usual suspects including Miss Luci, Gala & Blu, Kiff & Dina and many others. Dest & Gracee (off-center) danced and made merriment. 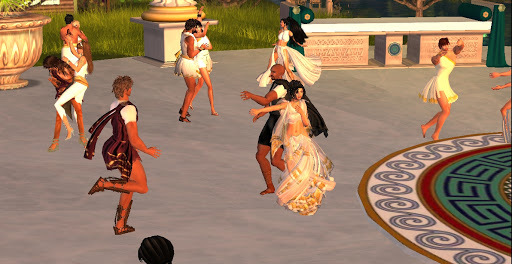 In SL, you pretty much are gonna need a toga for parties, so this was the day to pull them out and have fun. I went through my blog archive and dug up my post from Dest & Gracee’s wedding reception for a little nostalgia. If you read this, Dest & Gracee, I just want to wish you warmest wishes for many more anniversaries. 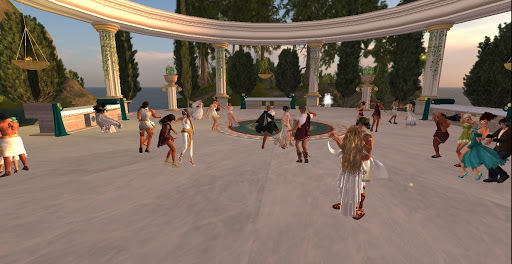 This entry was posted in Journal and tagged Friendships, Parties, Second Life. Bookmark the permalink.